When a customer calls and asks for a pallet 1.3m square, little do they realise what affect this will have on their ongoing transport costs. Let me try to guide you through Designing for Transport. So often, we are asked for unusual sizes of metal pallets and stillages. As we at Avatan Handling Equipment pride ourselves on our ‘Specials are our Standards’ mantra, we will always be happy to manufacture stillages that may be considered out of the ordinary. However, we will take time to discuss each customer’s needs. We will try to ascertain if the benefits of a special sized stillage actually outweigh the disbenefits and ongoing costs. 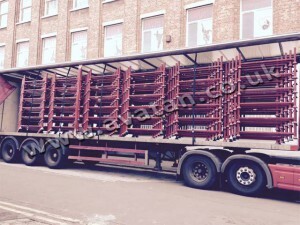 For example, if the need is for a stillage or pallet to accommodate an area slightly larger than a conventional pallet, but that pallet, once it is delivered to the customer will never again travel by road, then the additional transport cost incurred in the original delivery is never repeated. However, it that pallet will instead be routinely ferried by vehicle or transported within a shipping container, then minimising the inpact on the remainder of the vehicle space is of paramount importance. The standard UK trailer generally has an internal length of 13.4m and a width of 2.49m. They can generally accommodate up to 26 standard UK pallets, each 1000mm x 1200mm. Alternatively using Euro Pallets, 800mm x 1200mm, this capacity increases to 32 pallet spaces. Increasing the pallet size only slightly, e.g. 1000mm x 1250mm and the number of pallets the trailer can hold will drop significantly. If the second dimension also exceeds half of the trailer width, you might then be reducing the load capacity by a much larger proportion. Trailer heights are slightly more variable and range between 2.4m high and 3m high. Again, with full knowledge of each customer’s needs, pallets can be designed to suit the trailer height as well. Pictured here are some of Avatan’s rental Postracks. Offset stacked in fives, then stacked 6 units high, with 12 stacks of 30 per trailer, enabling 360 bases to fit on a 13m trailer with a height of 2.5m. We do this too with Euro 91 Cage Pallets. 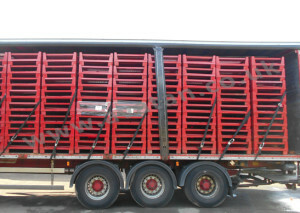 On a Mega Trailer with a height to accommodate just under 3m, we can fit 288 Euro 91 cages in 32 stacks of 9. It is true to say, in order to do this, the trailer is absolutely laden both from load weight and volume point of view. I have so far only mentioned 13m trailers. Of course many vehicles on our roads are ‘Rigids’ and will have a much smaller capacity. Many companies run 24′ or 32′ rigid vehicles. Generally these will offer the same internal width as the longer trailers again offering just over 2.4m internal width to accommodate 2 x 1200mm pallets between the curtains. Box trailers generally offer slightly less internal width and height than Tautliners. This is another area where designing to maximise capacity is important. There is very little flexibility in the internal width of containers as they are built uniformly to fit within strict tolerances onboard ships. Here again, if you are designing your product to fit within a shipping container, design it smaller rather than larger. You will be amazed how difficult it can be to fill and empty a shipping container if tolerances have been maximised. Leave space for manoeuvre or face the risk that your product will be damaged while being loaded or unloaded. Standard ISO Shipping Containers are 40ft or 20ft long, 8′ wide and 8’6″ high. High Cube containers are also routinely used extending the container height to 9’6″ high. (Other container sizes are available but cannot necessarily be shipped in the same way as standard ISO containers). Do bear in mind that the dimensions given are overall and the internal space is less than this and that the distance between the door framework also eats up space. I re-iterate… design smaller rather than larger and think carefully how you might manoeuvre that last of the load in through the doors. In short, in designing Pallets and Stillages for use on roads, rail or on the high seas, think carefully about how much space you might gain or lose. Consider what cost advantage or disadvantage these changes will make to you shipping budget. With a wide selection of pallet feet available, we guide you through how to make the best choice to suit your own stackable stillages and pallets. Pallet feet are generally used to facilitate easy, safe and secure stacking of steel pallets. However, some pallet feet are more easily stacked than others. And some pallet feet demand a little more floor space than alternative methods of stacking. Let me start with conventional pallet feet. These are the most commonly used pallet feet in the UK and are used for most British stillages. Generally conical in their shape, stillages using these are by far the most easily stacked. Fork lift drivers can quickly and efficiently line up stillages. The forklift driver will easily see that two of the pallet feet will be aligned with the pallet below and can be sure that the remaining two pallet feet will drop squarely into place. Care must always be taken to ensure that all stacking points are lined up. However, the pallet will reliably centre itself on each corner post with very little likelihood that it will be stacked incorrectly. Used extensively for motor industry pallets, the nesting plug can be used in conjunction with box section posts and fits almost entirely within the confines of the pallet dimensions. It only marginally increases the overall size of the stillage. Nesting plugs sit on top of or below the corner post. The dimpled nesting plug will insert into the tube of a superimposed load and hold the stacked pallet firmly and securely in place. Forklift drivers need to be highly accurate in their placement of stillages with little margin for error. In designing stillages using nesting plugs, it is generally necessary to add skids, (or runners), between the corner posts in order to spread the load over a larger surface area. Nesting plugs on their own would create a significant point load and would be likely to damage floors. When used with skids, warehouse and vehicle floors are best protected. Generally not available in the UK, this pallet foot is used extensively in Europe for Euro style cage pallets and box pallets. Like the conical pallet foot, it is easily stacked. The Euro style cage pallet uses a top frame for stacking purposes. The feet will simply be placed within the upturned stacking frame of the stillage below, which in turn holds the superimposed stillage in place. This foot adds nothing to the overall size of the stillage, However the required stacking top frame does add slightly to the pallet dimensions. Gives easy fork lift access to all sides of the stillages. When stacking stillages, it is imperative that fork lift drivers take care to ensure that all feet line up. It is essential that the feet can be seen to have properly dropped over the corner posts of the stillage they are stacked upon. Stillages and steel pallets must be stacked only on solid and level surfaces. Care should be taken to ensure that space is allocated between stacks of stillages. It is imperative that adjoining stacks of pallets cannot be disturbed unintentionally. We manufacture stillages using all of these stacking methods. We design post pallets and mesh and sheet steel sided stillages to suit each customers individual needs. If you have any requirements for stillages and wish us to assist please call today or complete an online enquiry form. What is the size of a Stillage or Metal Pallet? If I had a penny, (let’s say a Pound), for every time I am asked ‘what is the size of a standard pallet or stillage’, I would be a very wealthy man! Although there are common sizes used in the manufacture of pallets and stillages, most companies offering these products will offer to manufacture storage containers to suit individual customer’s needs. However, individuals have their own ideas about what ‘standard’ pallet means. I will try now to give a little guidance about what we understand as ‘standard’. Steel Stillages and Metal Pallets. In the UK there are no real ‘standards’ when it comes to sizing cage pallets, box pallets, post pallets and flat pallets. Individuals want steel stillages to suit their own specific needs. A steel stillage is three dimensional, i.e. width, depth and height. Commonly these will be manufactured to suit trailer sizes in order to make best and most economical use of transport. In the UK, we tend to default to base dimensions of 1200mm x 1000mm, (this stemming from our old imperial 48” x 40”). It is this size that hauliers use to identify that a full size trailer will carry 26 pallet spaces. Height is often determined by trailer capacity but as trailers vary tremendously in height, this is less quantifiable. It is safe to say that two 1200mm high stillages will fit within the height of most trailers. In Europe, they have a slightly different idea when it comes to stillage sizing. The European default size tends to be 1200mm x 800mm. Two x 1200mm or three x 800mm will most economically fill the width of a standard trailer. The European Pallet Pool Stillage is nominally 1200mm x 800mm x 970mm high. Up to 96 of these rigid cages will fit within a Mega trailer. 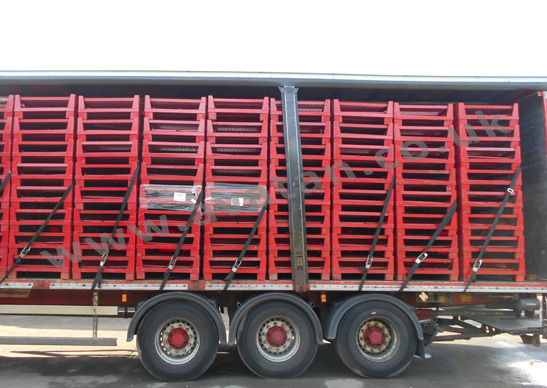 Or up to 270 Folding Euro Cage Pallets will fit on a Mega trailer. Not all metal pallets and steel stillages are designed to go on vehicles. Many are designed to accommodate a specific product and vehicle economy may not be a factor. At Avatan, we offer the best of both worlds. We have laid out our stall to offer both ‘Standard’ and ‘Bespoke’ Stillages. We carry stocks of European style Cage Pallets and Box Pallets, nominally 1200mm x 800mm, and most commonly 970mm high. We also carry stocks of CubiCages generally based on the UK pallet size of 1200mm x 1000mm. We also design and manufacture metal pallet cages and steel box pallets and post pallets to order in any size and quantity. From as small as 600mm square upwards. I think the largest stillage we have manufactured in recent years is 5000mm x 1320mm x 1200mm high. Entirely achievable but it did present some logistical issues while handling it through the manufacturing process. Entirely separate from this blog post, I will also cover the ‘standard’ size of timber pallets, and plastic pallets. I will also cover flat metal pallets manufactured from steel, stainless steel and aluminium. In answer to the question, ‘ What is the size of a Stillage?’, the response fits another unanswerable question… ‘How long is a piece of String’? Let us try to help you with answers to your specific questions, call Avatan Handling Equipment today. The cross over between Postracks and Pallet Racking is discussed. When weighing up how to best use the space within your warehouse, there are always many factors to consider but mainly, is the storage requirement a long term one or do you need an adaptable system that can be moved or replaced, easily and economically? 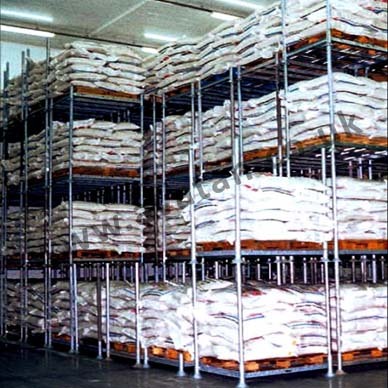 Pallet Racking is ideal for so many warehouses. 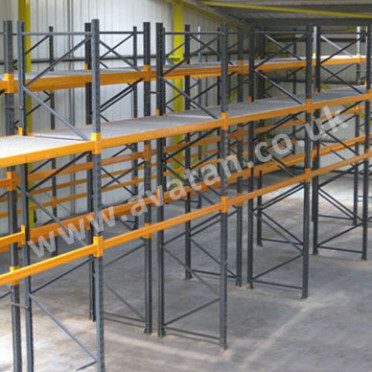 Conventional pallet racking with wide isles enables the user to access every pallet stored within the warehouse. However, this comes at the expense of the space it uses. The isles, the arteries of the racking system, are generally wide and can swallow up as much as 70% of the total warehouse space. If however, a more flexible approach is necessary to accommodate changing storage needs throughout the year, then conventional wide isle pallet racking may not be the most beneficial solution. Postracks may be that alternative. Postracks are simple Post Pallets that can be used in a similar fashion to Pallet Racking. Postracks are designed and manufactured with flexibility in mind. Each Post Rack comprises a strong and durable steel braced base upon which a palletised load can be loaded. A set of four removable posts dropped into the stub posts of the base, are then available to support another base placed upon them. The beauty of this system is that it will not be bolted to the floor and can easily be moved to another area within the warehouse. Equally, the Postracks can be block stacked without isle space maximising the number of pallets a warehouse can store within a limited area. Imagine Easter Eggs for example. They take up a lot of space for a short time within the year. They are all likely to be despatched within a short period of time. What better way to fill the warehouse than to block stack the Easter Eggs. The same would go for so many seasonal products and Avatan has many regular customers who hire Postracks for a short period of time each year. Turkeys at Christmas, Chocolate Eggs at Easter, bulbs in the summer and so many others consumer items where stocks are assembled and need to be stored for a short spell of time. Postracks, (post racking), are the answer to many of our customers. Oddly, another seasonal product is Carpet. (No, I would not have considered that to be seasonal either, but it is)! 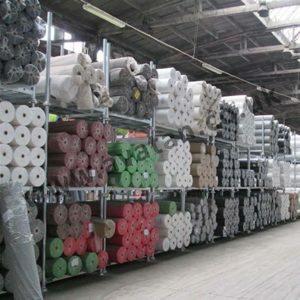 Carpet and underlay manufacturers, distributors and stockists build up their stocks in late summer in preparation for an increase in sales in the run up to Christmas and for the Sales. Although not palletised, rolls of carpet and underlay are often stored in Postracks. Again, the demountable nature of the Postrack means that when carpet manufacturers are quieter, the Postracks may be disassembled and stored in a much smaller area, leaving the vacated space for other uses. Avatan Handling Equipment prides itself on encouraging customers to use storage products best suited to their own needs. There are places and situations where the use of Pallet Racking is a no brainer. There are other warehouses where it would be madness to use an inflexible system and Postracks may then be the best option. If you have a storage requirement where you are left scratching your head wondering how best to proceed, give Avatan a call today on 020 8429 4444 and let us help and guide you. We featured a blog post last year commenting on how second hand stocks of stillages and other storage items had suddenly become available. In the current market, many items will sell very quickly. For example, pretty well as soon as we get hold of SHC33 Used Ex MOD Cage Pallets, they sell. Other items may not sell so readily but we are always on the lookout for saleable stocks. If you do have stocks of redundant Cage Pallets, Box Pallets or Post Pallets, do please get in touch. Ex Rental Cage Pallets for sale. Avatan offer a wide range of rental storage items and these will often be offered for sale, second hand, once a rental is complete and the goods have been returned and inspected. Our large fleet of rental Postracks, Euro style Cage Pallets and CubiCages enable us to regularly offer good quality second hand consistent items for sale. With three different styles of Postracks and a variety of Euro Cage Pallets most storage needs can be covered. Storage Equipment wanted and for sale. Yes, we would prefer to keep the factory busy and sell only prestine new equipment but so many of our customers look for a bargain and begrudge the extra costs for new stillages. It is with this in mind that we are constantly on the lookout for good quality stocks in good condition. If you have redundant stocks of steel pallets, stillages, plastic box pallets or plastic containers, and you wish to dispose of them, please do get in touch. If we don’t think they can easily be sold, or they are too costly to transport or store, then scrap may be the option. We won’t waste your time and will tell you. Recover what you can from your redundant storage containers and let us help you do that. 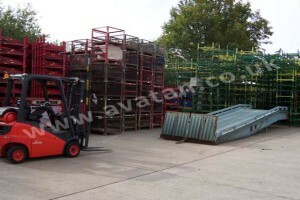 Contact Avatan today if you wish to buy or sell second hand storage equipment. We would welcome your call. 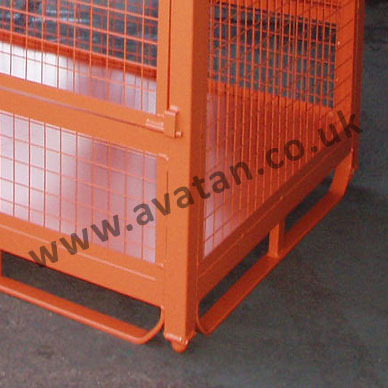 Although there is a standard Euro Cage Pallet used throughout Europe, often known as the Gitterbox, this style of cage in line with conventional steel stillages, can be made in any number of sizes. The standard Euro Cage Pallet has base dimensions 1200mm x 800mm and the height used in the European Pallet Pool is 970mm. EPAL pallets, used in the Pallet Pool, must carry identification stating the weight the stillages will carry, how many can be stacked upon one another, the place of manufacture and a sequential identification number. 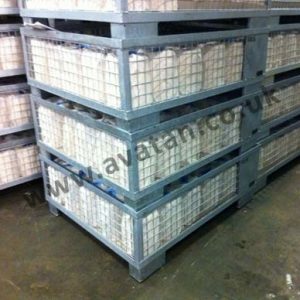 Pallet Pool cage pallets have economical timber bases and although these are robust and durable, many British customers consider them inferior as the timbers will deteriorate when stored outside and the stillage itself is likely not to be suitable for many food or pharmaceutical applications. 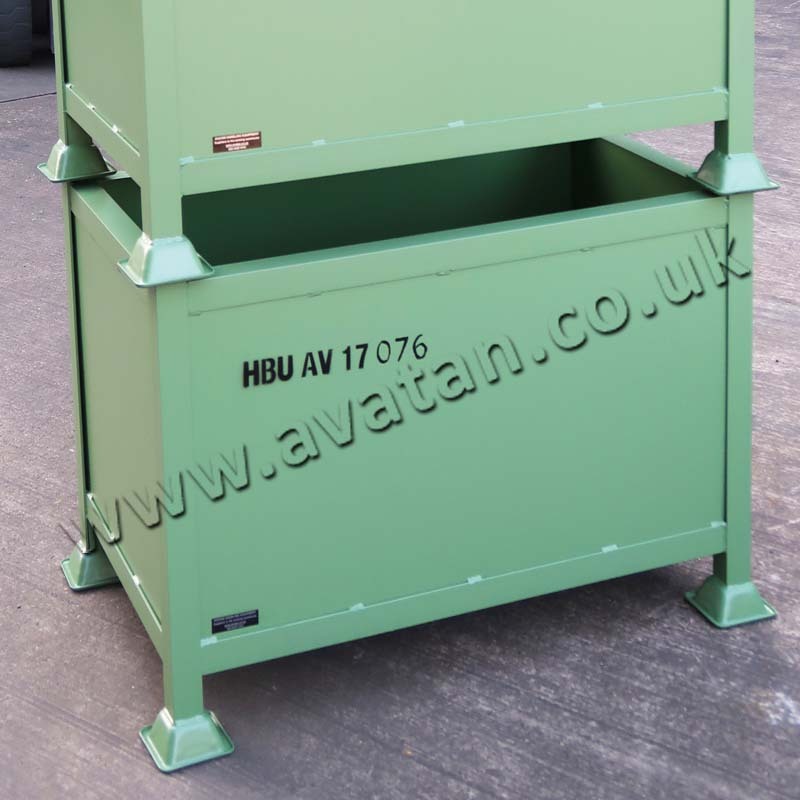 To overcome some of the British reservations, Avatan now routinely carries stocks of Euro 90 Rigid and Euro 91 Fully Collapsible Cage Pallets. Based on the Gitterbox style, our stillages have strong corrugated sheet steel bases. Euro 90 Rigid Cage Pallets are also available with hot dip galvanised finish, overcoming many of the reservations presented by food and pharmaceutical industry buyers. This style of cage has been introduced recently into a major cheese production company. On this occasion, the dimensions have been radically changed, increasing the base size and reducing the height. Load testing has confirmed that this particular unit may be stacked 10 units high. Our customer wanted to go higher still but at the time of testing, only 10 units were available. Another industry regularly in touch asking for Euro style cages is the Wine Industry and again, Avatan supply standard Euro cages to many vineyards. For bottled sparkling wines, which uses heavier bottles, we recently re-designed the Gitterbox style cage with larger dimensions, hot dip galvanised to protect the metal from the acidity of the wine and with timber decking to soften the impact of bottles landing in the cage. The uses for Euro Stillages are endless. These robust and economical cages could well work for you and we would welcome your enquiries. Call Avatan today. Although Avatan prefers to supply products to BEST suit each customer’s needs, the luxury of a lead time is sometimes unaffordable. In these cases, we will try to satisfy pressing needs from stock. Now carrying an ever increasing range of stock items, and with hauliers able to offer next day delivery services, cage pallets, box pallets, post pallets, roll containers and many other items can often be supplied immediately without delay. Even Aluminium Pallets are held in stock for immediate despatch. We have based our stock items around common UK and European pallet sizes. We carry CubiCages and Stackable Retention Units with dimensions 1200mm x 1000mm, i.e. UK pallet size. We also carry European style 1200mm x 800mm Gitterbox Cage Pallets with mesh sides and Gitterbox Box Pallets with sheet steel sides. CubiCages and Folding Euro style cages also satisfy most short term rental requirements. Similarly standard security roll containers designed optimally to suit distribution trailer dimensions are also held in stock for sale or for hire. How does this fit in with our ethos of supplying storage products best suited to each customers needs? Well, it fits in every way. If the customers needs are immediate, then compromise may be necessary with the importance for speed becoming the overriding factor. However, we still pride ourselves on being able to interpret individual needs and providing time is available, then we will design and supply the right storage or handling product at a most economical price. 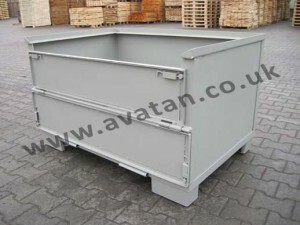 If you have requirements for steel, aluminium or stainless steel stillages or pallets, get in touch with Avatan today. With a mix of Euro style cage pallets commonly held in stock, Avatan is always surprised by how varied the uses are for these steel pallets. We are commonly asked for stillages for industrial sites, where boxed or loose products are the order of the day. Then we might get a call from a vineyard asking for this style of stillage. For bottles, the Euro Cage Pallet, known in Europe as a Gitterbox, is ideal. The standard Euro style timber deck offers bottles a much softer landing than a steel deck. But then wine is quite acidic and the vintner was concerned that the cages would rust. The answer to this one was to hot dip galvanise the stillages. Not only does this protect the steel pallet but it also ensures that the metal does not corode and leave unsightly or damaging marks on the contents. 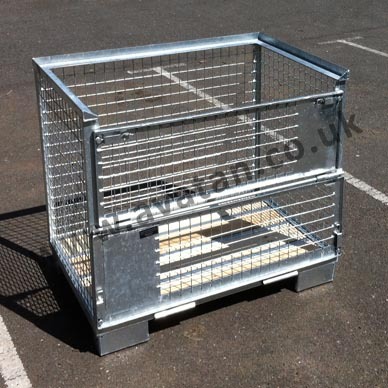 Galvanised Euro 90 cage pallets are currently now held in stock ready for immediate despatch. Other common uses for Euro 90 stillages have been for storage and drying of logs for winter fuel, car parts and often for storage of waste materials prior to recycling. The Euro 90 Gitterbox may also be supplied fitted with a numbered identification plate, necessary for all cages introduced into the European Pallet Pool. So also with stocks of timber decked and corrugated steel decked rigid Euro cages, generally immediately available, Avatan also holds large stocks of Euro 91 Fully collapsible stillages. With all sides of the Euro 91 gitter box hinged to the base of the pallet, these units fold flat for empty storage and transportation, enabling up to 288 folded cages to fit into Mega Cube trailers. 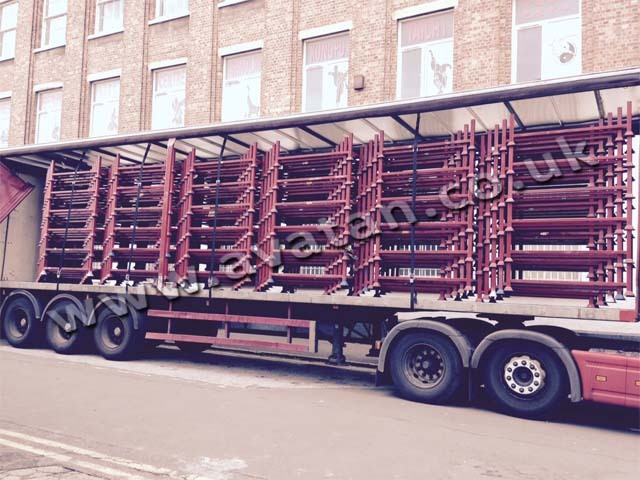 As transport can be carried out economically due to the condensed nature of the folded Euro 91 Cage, these are ideal for rental, especially short term, when transport costs can play such a significant part in overall hire expenditure. Although the pallet pool stillage has mesh sides by default, this style of pallet is also available as a box pallet and may be supplied with solid sheet steel sides in either the rigid Euro 90 or collapsible Euro 91 styles. If this is of interest to you, please do get in touch. Avatan would be pleased to assist you. What Is The True Value Of Small Footprint Pallets? When it comes to the large scale movement and transportation of goods – generally speaking, bigger is better. Yet, this isn’t always the case – there are occasions when specially designed small footprint pallets can be a much better choice for factories and retail sales floors. The particular benefits of small footprint pallets are still relatively unknown, because they’re still emerging as a crucial industry tool. For the movement of goods, it often goes without saying that a larger footprint equates to greater efficiency – the bigger your pallets and stillages, the more product you can move at one time. If you have the right infrastructure in place to support large footprint pallets, this can be the most efficient system. The question is – are there any real benefits to reducing the size of your pallet footprint? These days, the industry cannot really afford to ignore warnings about the environment. With the price of fuel constantly on the rise and the government looking to penalise businesses that don’t adhere to increasingly strict green targets, it’s about time that the commercial transportation industry started to think about reducing its environmental impact. The smaller and lighter the pallets, the less fuel will be needed to transport them – plus, the packaging materials needed to protect and secure them will also be significantly decreased. Here are just a few of the reasons why small footprint pallets can be a valuable benefit to your company. Commercial Or Domestic – a lot of companies use small footprint pallets, because they’re much easier to transport and handle – especially when it comes to the final customer. If you’re not dealing with enterprises or corporations, there’s really no need to use large scale equipment. In fact, it’s probably more of a detriment to your customers than anything else. If pallets are being delivered to domestic addresses, they need to be small enough to fit through domestic sized doors and spaces, or having been left on the vehicle following delivery are a hindrance to drivers attempting to deliver subsequent deliveries. Utilise The Space – obviously, pallets and stillages can be very bulky things. If you’ve got multiple large footprint pallets on a trailer, you may find it difficult to fully utilise the space. With small footprint pallets, this may lessen the problem – they can be slipped in the partial pallet positions left on a trailer. There might not be enough room for additional standard footprint pallets, but you’ll save money if you can slip in a few little ones. It’s all about efficiency, remember? A Wider Range – for those who manage warehouses or retail floors, there’s nothing more important than product logistics. The placement of your merchandise is vital, especially if you want to make sure that trained pickers can locate and identify specific products as quickly and efficiently as possible. If you want to maximise shelf space, it is sometimes necessary to increase the number of products displayed on one length of aisle. In order to do this, you might need to utilise pallets with a smaller footprint. A Smaller Shipment – last but not least, it isn’t always necessary to use a large footprint pallet for shipments. When smaller items or small quantities of smaller items are despatched, there’s no need to use larger equipment than needed – if you do, you’re only losing out on space, time and efficiency. When it comes to the large scale movement and transportation of goods, there is nothing more important than effective pallet management. Whilst it’s true that pallets play a basic role in the chain of supply and demand – they are ever present and absolutely vital. In order to fully maximise their value, we need to change the way that we think about them and the ways in which we use them. Without pallets, very few supply chains can function effectively – yet, they can also pose some unique supply chain problems. If your company is going to be successful, it needs to take these four factors into account – associated costs, safety, ease of use and environmental impact. In the interests of small footprint pallets, environmental impact is the most important. The issues surrounding green transportation are only going to grow in significance for the industry. Fortunately, it is getting easier and easier all of the time to make eco-friendly choices. For example, companies can now choose to invest in reusable plastic pallets, as opposed to the less green timber alternatives. When a timber pallet breaks, it is usually burnt – its lifespan is short, because it hasn’t been designed for extensive use. You could say the same thing about plastic pallets, except for the fact that they last a lot longer and they can be fully recycled when they eventually do break down. A plastic pallet, though strong, is also much lighter than a timber one – this means that it needs less fuel to be moved and transported. And then of course, there are steel, aluminium and stainless steel. Although not indestructible, their life expectancy is massively longer than timber and plastic options. Unlike plastic pallets, steel pallets may be manufactured economically and easily in bespoke smaller footprint sizes and in any quantity, without necessity for expensive tooling but do weigh more than plastic or aluminium pallet options. For further efficiencies, pallets may also be hired rather than purchased, maintaining cash flow flexibility for future growth and prosperity.